Bringing up religion and spirituality is one of the quickest ways in this culture to shut down genuine discourse as people jump to conclusions and defenses go up, and yet it is something that is deeply important to most of us. Whether we deeply engage, firmly reject, or seek in confusion, most—dare I say, all—of us have strong feelings and opinions in this department. Often, there are conflicting feelings and opinions even within the same person. So far on this blog, I have made a few references to the fact that I believe in God and am an Orthodox Christian, but no more. Even those small “passing comments” were by no means throwaway comments but very intentional and difficult for me to write. I would debate about writing the word “God,” include it in a sentence, delete it, put it back, sit on it for a while to see how it felt, take it out again, check in with my deepest values and put it back, and leave it, but still be uncomfortable and worried about how someone (everyone) might take it, how they (you) would judge me, how it would be interpreted and misinterpreted, etc. Have you ever done this? Oh, how that describes so much of my last year. 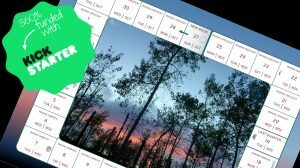 The intensely personal and self-reflective nature of my journey has many uncomfortable aspects, and for once I am not just pushing through it or pushing it down or burying it or whatever, but allowing, inviting, even, the discomfort. 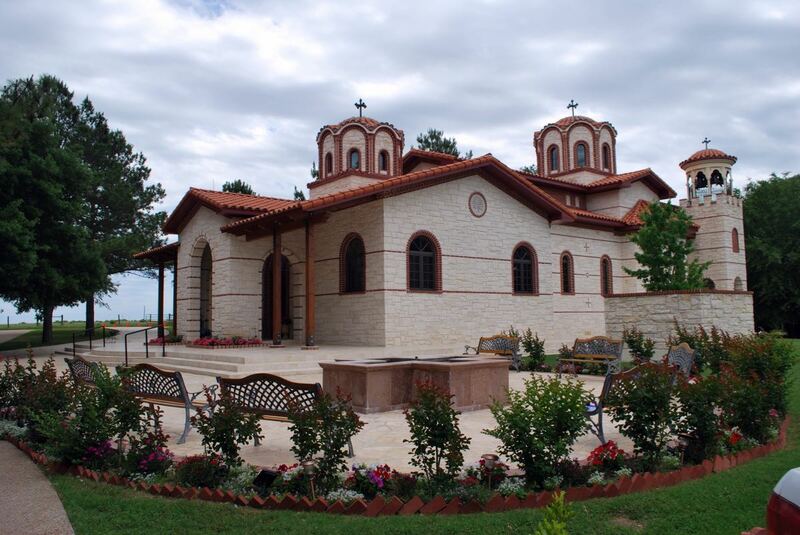 So I would like to tell you about my recent visit to an Orthodox Christian monastery, and to occasionally bring up my experiences and views as an Orthodox Christian that are relevant along my journey. 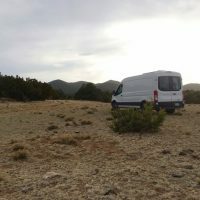 Like all the other topics on this blog—my experiences with autism, with traveling solo as a woman, van dwelling—this is nothing more or less than an account of my personal journey. I have no interest in trying to proselytize nor do I want to judge anyone else’s personal journey. 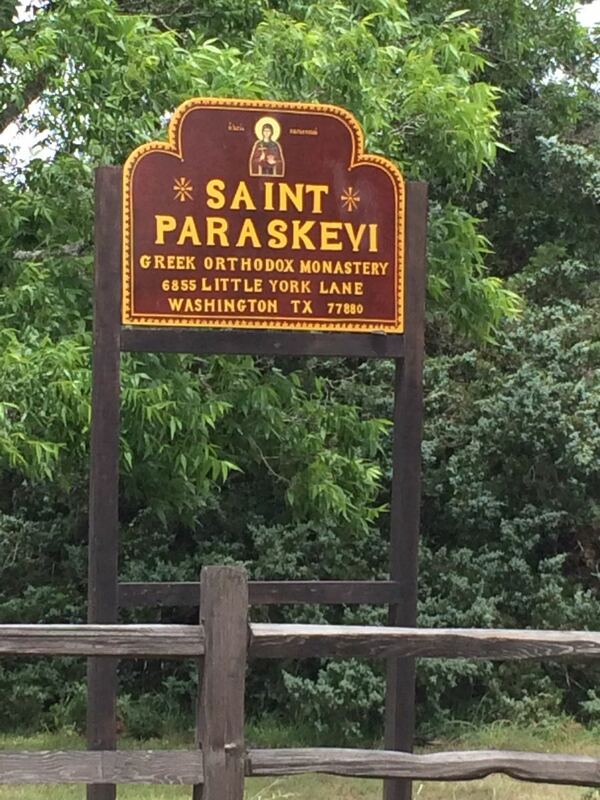 With that disclaimer out of the way, I’d like to tell you a little about the very lovely women’s Monastery of St. Paraskevi in southeast Texas. 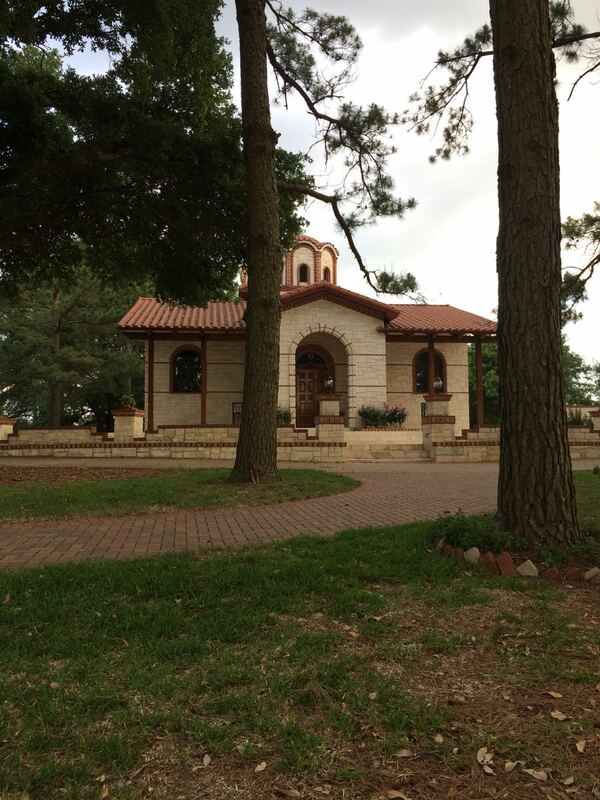 About an hour’s drive from Houston is a small enclave of Greek nuns. Another one of my intentions for this journey has been to occasionally visit orthodox monasteries, but I’ve been a little intimidated by the prospect. I’ve only been to two monasteries before in this prayerful way, not counting monasteries that are set up for tourists, and though I went to both several times, the first time was always with, and arranged by, someone else. Now that I don’t have the someone else to do the introductions for me and help me through the awkward (to me) encounters of I-want-to-visit-your-home-but-I’m-not-like-one-of-those-tourists-but-still-have-tourist-level-basic-questions-like-can-I-talk-to-the-monks/nuns-and-who-do-I-even-ask-that-of-and-how-do-I-find-him/her-and-what-if-he/she-is busy. Cue social anxiety. Avoidance, you’re up next. I haven’t plucked up the courage to visit a monastery on my journey yet, so when my friend said she wanted to go, but needed a ride, I was more than happy to drive her so I could observe and learn how she handles such things, and maybe be less fearful of trying it on my own. She is also Orthodox and has done this monastery visit thing by herself several times before, which in my mind makes her much more experienced. We tried several times to call ahead, but the nuns don’t seem to have someone stationed by the phone, and after hemming and hawing, we decided to chance it. We also agreed that if we got there and they weren’t up for visitors today, we would be okay with just turning around. Upon arriving, we didn’t see anyone at first, and walked around the grounds a bit to get oriented and see if we could find someone to ask whether we could visit today. 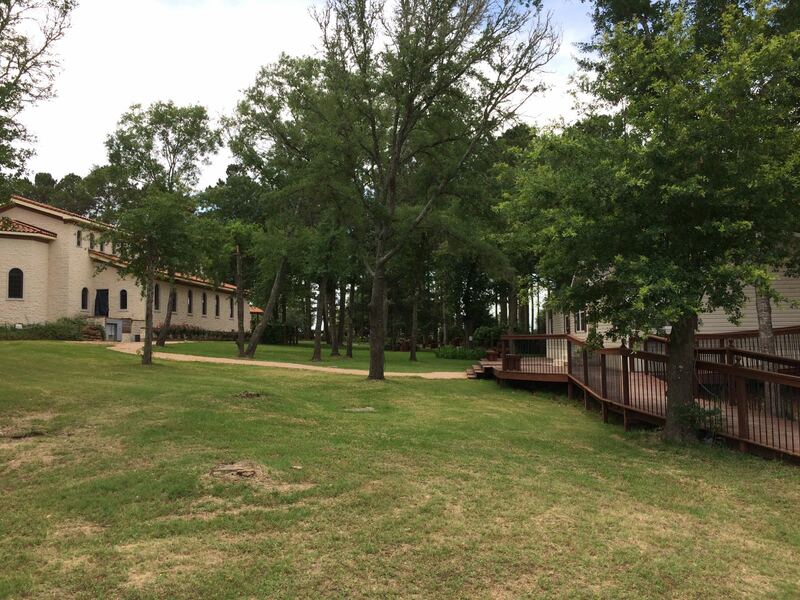 Entering from the parking lot, on the left is the refectory and the guest house is on the right, with a dining room and sitting room for guests, and a small bookstore. As we approached the church, we finally saw one of the nuns and she greeted us warmly. She was very welcoming and opened the church for us so we could venerate the icons and meditate in silence for as long as we liked. We got to ask her about St. Paraskevi, since neither of us knew her before. 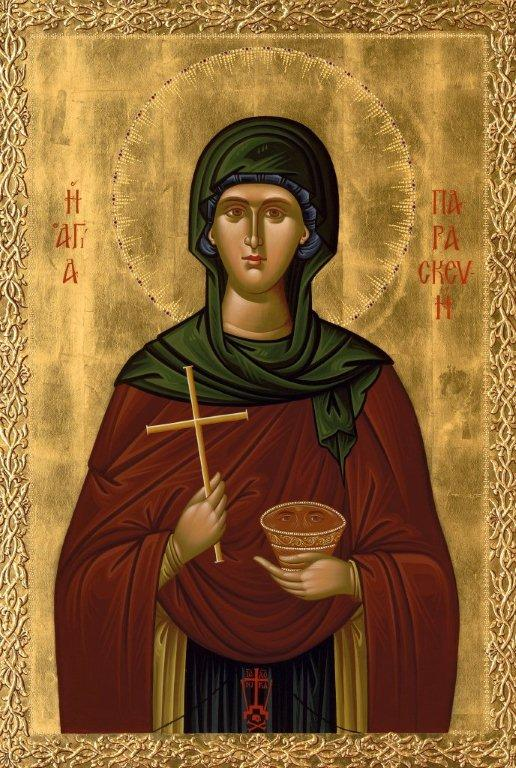 Paraskevi was born in Rome around 140 AD to christian parents and had a very pious upbringing. She led a women’s monastery in Rome for about ten years and then started traveling alone to witness for the faith. Christians were alternately persecuted and protected at this time, so she was brought to trial and freed several times in her life before eventually being martyred. You can read more on the saint’s life here. The nun we randomly encountered turned out to be the Abbess, the sister in charge of the monastery, and she showed us around a little and took us to the guest house for lunch, which was to be served soon. She seemed to take it for granted that we would stay for dinner, too, and vespers and compline, and matins is at 3am if we like, and…. She made me feel comfortable enough that I was able to express a bit of my apprehension at just showing up without confirming in advance that they were prepared for visitors today, or at all, and she put me entirely at ease. That felt so incredibly wonderful. It was backed up by every encounter we had the entire time. We did indeed stay for lunch, and vespers and compline, the prayer services that end the day. The Abbess gave us a blessing to stay the night in the parking lot, so we got up for the first service of the day, matins, at 3am, went back to bed a little after 4 and were up again for breakfast at 8. In between services, we walked around the grounds, sat in the lovely flower gardens, watched the peacocks, talked a little, sat in silence a lot. The nuns keep goats, chickens, have a huge vegetable garden as well as colorful flower gardens sprinkled throughout the grounds. They recently planted a small grove of olive trees, though it will take several years before they mature. There is also a lake with ducks on the property, and we sat at the shore until the bugs started to bother us too much. They have limited overnight accommodations for guests, which seemed to pain the Abbess and expansion might be in their long term plans. With four other overnight guests, they were full, so it was good that we brought our own mobile house. It also gave me an opportunity to play host to my first overnight houseguest, which I loved. Several other guests came throughout the day for a few hours at a time. Meals were with the other guests as the nuns ate separately. The front of the church. I didn’t take any photographs inside out of respect for the space. Frankly, I felt a little uncomfortable taking this one. I didn’t come to be a photo-mongering tourist, I came to pray. In the morning we walked the grounds a little and sat in the very lovely, colorful flower gardens and watched peacocks for a while before leaving. I rather hope I’m not in southern Texas in summer again, but if I do come this way at another time of year, I will make it a point to come back here. All of the nuns we spoke with were wonderful and open, and I wouldn’t mind staying here for a while to join in the work of the liturgy and the work of the kitchen. Or soap making or goat milking or whatever else they need done. By the way, the nuns bake delicious pastries to sell as part of their income, and you can order some online at The Sweet Meadow Bakery. References: quote from Star Trek Deep Space Nine, Season 1, Episode 3, “A Man Alone”, featured photo at top is from their monastery website, www.stparaskevi.org.